From the Manage tab select Galleries. All galleries you have created will be listed. You can also change the expiration date directly from the Gallery Management page. Click on the expiration date and select a new date from the calendar popup. 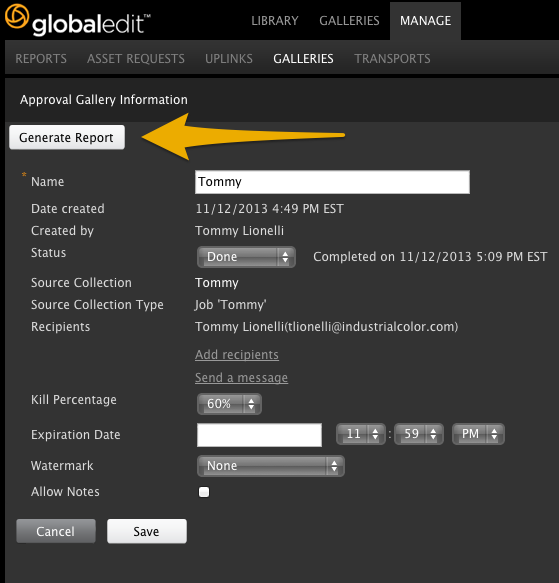 As a user of globaledit, you have the option of generating a Kill/Approval Report PDF when managing your approval/kill galleries. Click the Manage tab and then click on Galleries. Here, all of your approval galleries are listed. Simply click on the gallery you wish to generate a report for and you will be brought to that galleries’ settings page. Regardless of the status of the gallery, you can generate a report that will detail which assets have been killed/approved and those that have not. 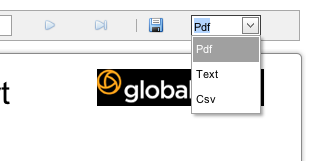 The actual report shows several details and you have the option to save it as a PDF, Text, or CSV file.